diamenz wrote: nice highlights Dee. Shame about the Han roster... insecure folk want the net fame using other peeps work. Yeah the game was tough, I felt like I was battling from a few points down all game. I tried to pressure the guards, but they were to crafty. Activate Limnono in the roster, hit F4 on your keyboard. Close out of Limnono and exit the roster. The portraits will be kept for the duration of the game until you turn it off. Also, please check out the new external plugin thread by TBM. It looks like they can be kept at all times. 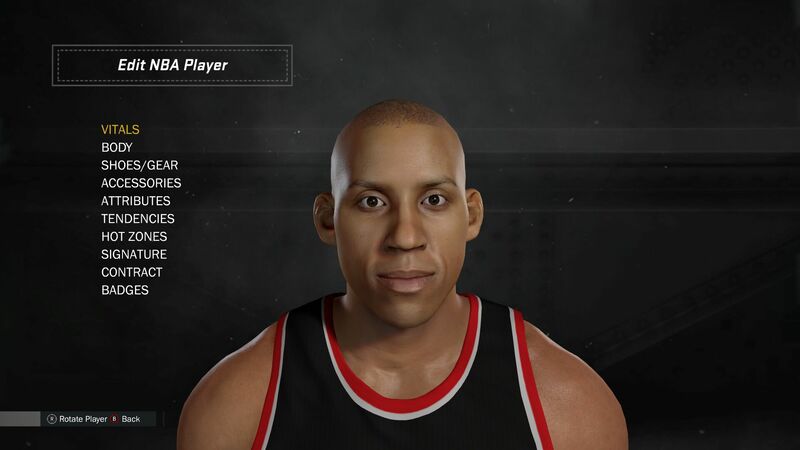 There will be a soft update later this week that includes the games Reggie Miller. You will not have to redownload the mod pack. Credits to Han Roster for locating the Miller in the game files. NOTE: Does anybody have any videos or screenshots of there drafted teams? Ive posted quite a few videos on here, it would be cool to see some other user videos or screenshots. Amazing job. What sliders do you use? Man, this is absolutely amazing. I just want to say I appreciate all your hard work and everyone else too. Compared to last year, there is some really awesome things happening. Once my buddy and I complete our fantasy playoff, I'll share the winning roster. polandblood wrote: Amazing job. What sliders do you use? I use HOF default mostly when I play the CPU, with fouls turned down to 25 and body up sensitivity turned down to 25. However, I don't like the default HOF sliders, it basically says that the computer can hit a shot with an average shooter, and you can take the same shot with an above average shooter and miss it. Where in real life does that make sense? When I play another human, I do 50-50 user/cpu sliders with body up sensitivity set to 25 and fouls at 25, also... I set the offensive rebounding to 40 and defensive rebounding to 60. Thanks for the support, hope this helps. smtesar wrote: Man, this is absolutely amazing. I just want to say I appreciate all your hard work and everyone else too. Compared to last year, there is some really awesome things happening. Just a quick video of me messing around using the 96-97 Hornets court after a draft. Messing around using the 96-97 Rockets court with UFDRD43. The first couple moves I pull off with Olajuwon are classic. This video is just to show you the court in action. How do you pull off the animation at 0:13 when he's holding the ball out? smtesar wrote: How do you pull off the animation at 0:13 when he's holding the ball out? I use an xbox 360 rock candy controller. But it's hard to say exactly what I do when I'm not actually in the moment playing. But, I think my info above is right. Using the 96-97 Hawks court with UFDRD43. Just messing around to show you the court. My next goal is to get Nate Thurmond in this roster. He is one of the only big names missing. I considered Orlando Woolridge a big name, and thanks to PeacemanNOT, we got him. Btw, if anybody pulls off a free throw line dunk with Jordan in a game, please post it. I received a PM asking that I add Roger Mason, Anthony Randolph and Juwan Howard in the next update. I'll try to get that update out soon. Dee4Three wrote: I received a PM asking that I add Roger Mason, Anthony Randolph and Juwan Howard in the next update. I'll try to get that update out soon. I see you've been working on classic courts like 2k16, really cool. The amount of classic courts available for 2k14 are amazing. What about classic jerseys? How difficult would it be to add those? Like old school jerseys for the Hornets, when CP3 was playing there. I'm not sure if you're able to insert new jerseys, or just replace current ones in the game. Last year, we were able to put together the 92-93 Suns home jersey (The away jersey was part of the game already... though not accurate). And we were also to do the home and away for the 06-07 Nuggets. This year it seems possible again. Just with everything else going on, I havn't been able to tackle those yet. Maybe in the future. I'll be releasing All Time Teams Roster based off of this roster within the next few days. The Charlotte Hornets will be represented by the classic Charlotte Hornets and New Orleans Hornets players, and the New Orleans Pelicans will be represented by Charlotte Bobcats and New Orleans Pelicans current players. This seems to work the best. Players will have mostly accurate portraits with the teams they are with (About 98% of players), and the players will be put in there best season with that team. I think you guys will like it. Also, NO DUPLICATES in that roster. Hello. I have question about this nba2k17 Ultimate Fantasy draft roster. I already have UFDR MOD PACK - UPDATED 10/29 file and External File Plugin file. And I placed the contents of that download in your NBA 2K17 main directory, and place the contents of the Mod Pack in the modded folder. But i can not see Charles Barkley and Chris Webber at my nba2k17. I want to see them. Please tell me how can i play with them. you said there are a lot of legend players in this UFDR MOD PACK , but there are not many real files. Is not it done yet? I can not find way about download "Roster Name: UFDRD43". How can i get this roster? sapa707 wrote: Hello. I have question about this nba2k17 Ultimate Fantasy draft roster. There's a problem with your statement. You say that you downloaded the mod pack, and can't see Webber and Barkley in game, but you than say you can't find a way to download the roster... that makes no sense. How would you know that they didn't show up in the roster if you couldn't download it? Do you have the Steam version of the game? Nobody else is missing those players. Everybody else is using the roster just fine. Also, the mod pack contains quite a few files, which are a few new players faces, as well as cyberface tweaks and a bunch of portraits. Hi.my english is very bad. may i ask you the following list may appear in future updates? kevin12335 wrote: Hi.my english is very bad. I don't have faces for any of those guys yet. Some might be created for the classic teams roster, when those are done I will add them. But i have 2 more question. 1. "Do you have the Steam version of the game?" means PC platform? And Is it ok to put all these files in "Modded" folders and run the game? You must actually buy the game off Steam to play with this mod. Also cracked users aren't allowed on this forum.